Frying without oil is a completely new concept to a lot of people. Does an air fryer really work? Hot circulating air is used to cook the food instead of excess amount of oil. Reading through my Avalon Bay hot air fryer review will let you have a better understanding about this hot air frying concept. Is it easy to use? Does it involve a lot of work just to cook some French fries? Well, this Avalon Bay hot air fryer will certainly appeal to you as it is very user-friendly with just 2 knobs to operate. Or you can get the digital model if you do not like turning knobs. Does the food taste nice? I mean, what’s the point of air deep frying chicken wings that end up tasting limp and soft instead of being crispy and moist, right? Actually, you will be very happy with the texture and taste of the cooked food. Healthy food aside, tasty food is just as important to us. 1.1.1 How does the air fryer work? You have a choice of black, white, or red for the manual Avalon Bay hot air fryer. 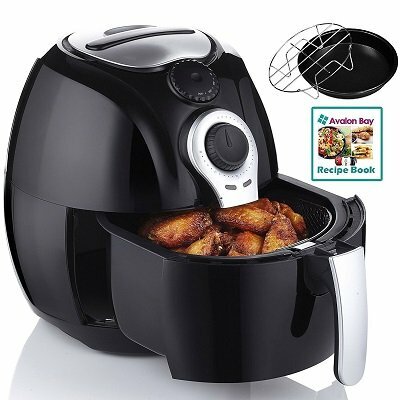 As for the digital Avalon Bay air fryer 230B, you can only get it in black. Included with the air fryer is 1 non-stick baking dish, 1 multi-use rack, and a 52-page Avalon Bay recipe book for air fryer. The Avalon Bay hot air fryer has a powerful fan and stainless steel 304 heating element fitted to the top part of the machine. The heating grill element heats up the air inside the fryer. The fan blows the hot air all around the food at a rapid pace. The hot air cooks the food evenly on all sides. The fat from the meat ingredients drips down onto the drip pan below and the circulating hot air lifts up the oil particles to coat the food and cook them. All these are happening in a very fast consistent motion and the food cooks fast in its own fat. Instead of adding oil to the food, in fact the original fat in the food is removed. There is less grease in your food and no greasy smell in the kitchen. For recipes such as roasting vegetables, a little oil is needed to get a crispy texture. In short, ingredients with fat content do not need additional oil added whereas those without fat content such as vegetables or fresh homemade potatoes will look and taste better with a bit of additional oil (about a tablespoon) added to them at the start of the cooking cycle. The additional oil produces a browning effect as well as a crispier texture. Minimum grease in your favorite deep fried food certainly sounds appealing, a winning point here. There is no flipping of food as like when you are cooking using a pan. There is no danger of getting scalded by hot oil. Most of the hard work is done inside the Avalon Bay air frying machine. No burnt or overcooked food as the hot air cooker allows you to set a time and temperature. For the manual air fryer, there are only 2 buttons to adjust – the timer and the cooking temperature knobs. You can set to a maximum of 30 minutes and choose a temperature between 180 – 400 degrees Fahrenheit for the manual model. Temperature range for digital model is between 140 – 400°F and it comes with a 60 minute timer with auto-shut off. However, adjusting the temperature is not that easy in the manual model as the temperature knob runs in temperature jumps of 176, 248, 320, 356 and 392 degrees. These numbers do seem rather odd. Normally, recipes do not come with such numbers as 248 degrees. For food that needs a 300 degrees, you might need to cook at 248 degrees for a certain period of time, then adjust to 320 degrees for a shorter period of time. There is a power indicator light as well as a heating-up indicator light. The heating-up light blinks as the heating element switches on and off to maintain the set temperature. The automatic shut down when the timer goes off is an attractive feature when compared to using a pan or skillet. This frees up your time when cooking is in progress as you do not have to stand in front of the fryer. Standing in front of a hot stove is not exactly comfortable nor appealing. Well, looks like another winning point here too. You just cut and prepare the ingredients and put them into the cooking basket. Raw meat needs no oil added as the food will cook in the natural fat in the meat. Grilling vegetables will need about a tablespoon of oil to make them more crunchy and tasty. You do not need to thaw frozen food before putting them into the air fryer. Frozen chicken tenders, frozen vegetables etc. can be cooked in their frozen state. However, raw frozen meat such as pork, chicken need to be defrosted before cooking them. You can stop the cooking halfway to check on your food, turn it over, add more time or change the temperature. Certain food such as French fries, chicken wings cook better when you shake the food halfway during the cooking process. However, remember not to press the release button while shaking the food as this will separate the basket from the drip tray. 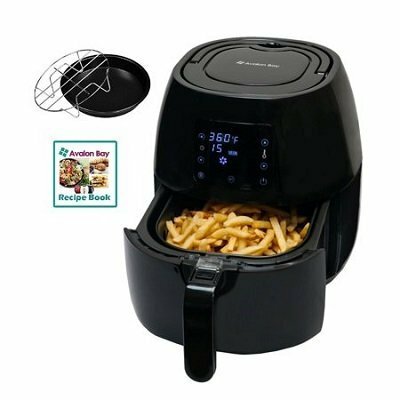 Yes, with the hot air fryer, you get the choice of fry, grill bake or roast with just a tablespoon of oil or even no oil added to get healthy fried food. The hot air deep fryer comes with non slip feet. It has an auto shut down feature when the timer reaches zero and the cooking process is completed thus reducing risk of burnt food or starting a fire. There is a handle on the top of the air fryer. This makes it easy to lift and carry the fryer around. The handle slides back into the machine and does not jut out causing inconvenience. The power cord is short and can be pushed back into the storage compartment after use thus providing a neater storage space besides avoiding accidental entangling or tripping. You have to make sure there is a 4″ free space above and around the airfryer. It comes with overheat protection safety feature. Food ingredients are placed in the non-stick mesh metal basket. The 3.7 qts cooking basket has an 8″ diameter and is about 3.5″ deep. There is a maximum indicator mark. This should hold enough French fries for about 4 people or about 3 to 4 large egg rolls. According to one customer’s Avalon Bay hot air fryer review, homemade freshly breaded chicken and fish turns out great, crispy and not overcooked. The advantage of a mesh metal basket is all round even cooking of food. There is no blockage of the fast moving hot air. To get the food to have the crispy outside and moist inside effect will depend on how well the food ingredients are exposed to the rapidly moving heated air. That is why it is recommended not to put in food above the maximum mark in the basket. If the food are piled on top of each other as in French fries, then giving the basket a shake will ensure more even cooking. A quick release button separates the basket from the drip tray. This air fryer comes with a detailed instruction manual that makes starting out on your hot air cooker less of a hassle. However, there is a learning curve and experimenting with different times and temperatures will bring out the best results. You might need a few tries before you get the result that pleases you. A reference cooking guide on the top part of the machine is good for a quick reference instead of looking up the settings on the manual booklet. With these accessories, you’ll have more cooking options. The dual rack allows for more food to be cooked at the same time as the rack increases the cooking surfaces inside the machine. You can also cook 2 different types of food at the same time using the dual rack, for example, fish fillet and fries. The food that cooks faster is placed on the top rack. The frying pan (6.5″ diameter) can be used to fry an omelet, fish fillets, pancake, potatoes etc. These accessories are dishwasher safe. The air fryer can easily fit into your kitchen counter top and it occupies about the same space as a rice cooker. You can also use other brands air fryer accessories as long as these fit into the fry basket. Baking a cake is really simple with the air fryer. Put the baking dish filled with the cake mixture onto the cooking basket. For a 10 ounce cake, you’ll need to set the timer for 20 – 25 minutes and a temperature of 320 degrees. Muffins will need 15 – 18 minutes at a temperature of 392 degrees. You can use the Avalon Bay hot air fryer to reheat food too. Set the temperature to 302 degrees F. and you’ll need about 10 minutes reheating time. Crispy food will still retain their crispy exterior surface. Cleaning up is hassle free. The removable cooking basket and the non-stick drip tray can be cleaned in the dishwasher. The accessories are also dishwasher safe. Cool down the air fryer (about 30 minutes) before wiping the external body with a damp cloth. The inside of the fryer can be wiped using hot water and a non-abrasive sponge. If there is any food lodged in the heating element, it can be easily removed with a cleaning brush. The Avalon Bay air fryer seems to be a time-saver as cooking is fast and you do not have to watch over the food while in the air fryer. Majority of food cooks under 30 minutes. Compared to the oven, air frying is much faster. Take for example baking mini pies. According to a customer’s review, her mini pies cook faster in the airfryer by about 10 minutes and that is not counting the extra time needed to preheat the oven. That would mean an extra 20 minutes compared to the fryer. 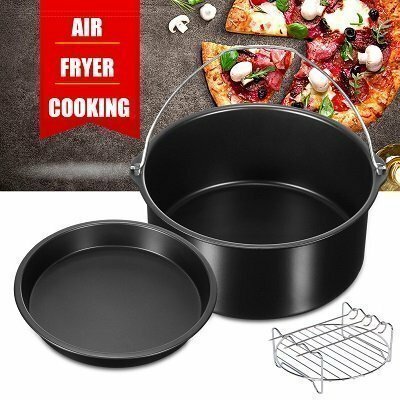 A 3.2 pounds cooking basket is considered big when you compare it to the 1.8 pounds of the Philips air fryer or the 2.2 pounds of the Tefal Actifry. The metal mesh cooking basket and drip tray being dishwasher safe, makes washing up less of a hassle. Compared to both the Philips and Tefal models, the Avalon Bay hot air fryer is cheaper. There is a big difference in price considering that they have more or less the same features. The main feature of cooking food with no oil ( meat foodstuff and frozen types meant for baking) or less oil (maximum usage is about a tablespoon) is the same for all air fryers in the market. On top of that, the Avalon air fryer has a bigger food capacity too. Regarding the taste and texture of the cooked food, majority of customers’ feedback are positive. Crispy on the outside and juicy inside, the cooked food is delicious and appetizing. It seems like a good buy at the present price. There is a black, red or white model with the white air fryer cheaper compared to the black fryer by about 50 plus USD at the time this Avalon Bay air fryer review was written. Both models have the same features, the color being the only difference. The only disadvantage would be the learning curve. Take for example homemade freshly breaded food. Some commented about being able to cook freshly breaded food with great results while a few were not successful. The manual does come with the setting times for a number of popular food, frozen as well as fresh. There are lots of air frying recipes online to check out. You’ll need to have the time and patience to keep experimenting to get the perfect result. Considering that this modern home kitchen air fryer is very versatile and can cook a large variety of food real fast and hassle-free, it will be great for those with a busy schedule every day. Those with small kitchens with limited counter space for a number of kitchen appliances will appreciate the fry, grill, bake and roast features of this air fryer. Families with small children will love the healthier French fries and fish fingers that their kids now get to enjoy. When you checked out the excess oil at the bottom of the drip tray when cooking is done, you will certainly be glad that you’re serving your kids air fried food instead of the deep fried ones. 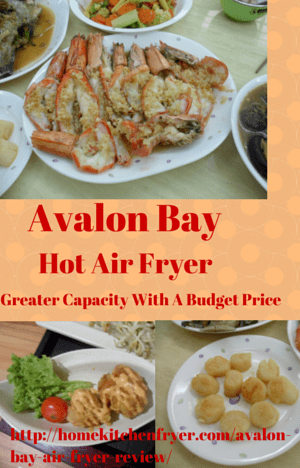 Investing in the Avalon Bay hot air deep fryer is investing in your health. Greaseless deep frying in the air fryer is a healthier version than deep frying in oil the traditional way. The air fryer is a natural healthy cooking solution to otherwise high calories oil fried food.